Gap junctions, or intercellular junctions, are macromolecular complexes that form channels in the adjoining plasma membranes of neighbor cells. These channels make possible the direct cytoplasm-cytoplasm communication between the two cells. Virtually, all cells of solid animal tissues may establish communication with their neighbor cells by gap junctions. Although gap junctions are included in the textbook chapters dealing with cell adhesion, they actually should be studied together with the mechanisms of cell-cell communication, since this is their main function. Gap junctions were discovered in the 1960s by dye intracellular injections. A dye injected into one cell could be observed in adjacent cells a bit latter. This could be explained if there was a direct connection between the cytoplasms. At transmission electron microscopy, transversely cut gap junctions appear as long straight segments made up of the two plasma membranes of contiguous cells. The intercellular space is so obliterated, about 2 to 4 nm width, that it can only be observed at high magnifications. In tridimensional view, gap junctions form actually irregular plates in the plasma membrane. The shape and size of these plates depend on the cell type and its physiological state. For example, in hepatic cells they can be 0.3 mm in diameter. 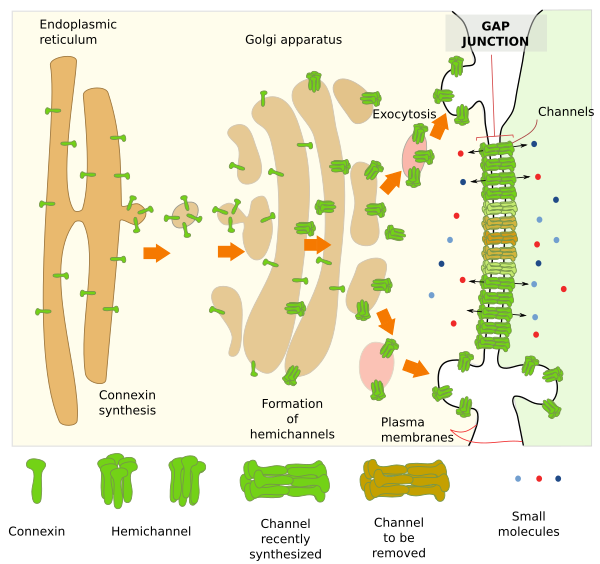 Gaps junctions are made up of transmembrane proteins called connexins (Figure 1). In chordates, included humans, 21 genes encoding for connexins have been found. Groups of six connexins associate to form a connexon or hemichannel. Each hemichannel in the plasma membrane of a cell lines up with another hemichannel of the plasma membrane of an adjoining cell. In this way, two hemichannels form one channel of about 1,5 nm in diameter, which is able to establish a direct cytoplasm-cytoplasm communication between the two neighbor cells. Small molecules, smaller than 1000 or 2000 Dalton, can go through the channel from one cell to the other. In insects, the diameter of the channel can be even larger. A region with tightly packed channels is the gap junction, which may be variable in size by having more or fewer channels. Sometimes, gap junctions can contain up to 10000 channels, involving about 120000 connexins. Figura 1. Synthesis, assembly and formation of gap junctions. The yellowish and greenish cytoplasms belong to adjacent cells (Modified from Laird et al., 2015). Gap junction channels let simple carbohydrates, second messengers like cAMP or calcium, amino acid, and small RNAs swaping between the two connected cells. However, proteins, lipids, long RNAs, or large molecules in general, are not allowed to go through. Gap junctions make possible both electric and metabolic synchronization of adjoining cells by allowing ions and molecules to be exchanged between them. For example, neurons can coupled be electrically synchronized (similar membrane potentials) and therefore synchronize their activity very efficiently by gap junctions. In this way, neurons can communicate between each other avoiding the release of neurotransmitters and without performing transduction mechanisms, which would slow the neuronal population synchronization. Gap junctions in neurons are known as electric synapses. Similarly, glial cells form a network of cells connected through gap junctions. The rhythmic contractions of the heart muscle, the uterus during birth, the intestine during peristaltic movements, and the accommodation of the iris muscle of the eye to different light intensities are mediated by cellular coupling through gap junctions. Non-excitable cells like hepatocytes and somatic cells of ovarian follicles are metabolically synchronized by gap junctions. Another example can be found during blood clotting when platelet cells attached to the blood vessel walls establish gap junctions between each other increasing the adhesion strength of the whole platelet aggregate. The properties of a channel depend on the type of connexins it is made up of. Under some differentiation stages or physiological needs, cells can modulate the channel permeability by differential expression of connexins. Hemichannels can be homomeric (the six connexins are the same type) or heteromeric (different types of connexins), but not all combination of connexins are allowed. Most cells express at least two types of connexins. In addition, channels can be homotipic (both hemichannels are equal) or heterotipic (hemichannels have different connexin composition). Hemichannels are switching from open to close in a more or less random behavior. The time that they are kept open is influenced by many variables like inner pH, concentration of some ions like high calcium concentration, and also by extracellular elements like dopamine in some retinal cells. Practically, all hemichannels are affected by the membrane potential. These mechanisms produce fast or short-time responses. There are also long-time mechanisms for regulating the functional state of gap junctions: they can be newly formed, grow, divide, fuse, decrease and disappear. Cells can control the number of hemichannels. They are removed from the plasma membrane by endocytosis, and increase their number by exocytosis. The assembly of hemichannels can be also regulated by postranslational modifications of connexins, like phosphorylation. New hemichannels are usually added to the edge of the gap junction plate, and those in the middle are usually marked for removal. There is a constant recycling of hemichannels that let to a complete turnover of the gap junction plate in a time period of about hours. Connexin gens mutations lead to about 14 diseases, like deaf, dermopathies, cataracts, cardiomyopathies, and several types of cancer. By studying some of these diseases, it has been found that hemichannels can be used for functions other than intercellular communication. For example, they may directly communicate cytosol with the extracelular environment. Pannexins are transmembrane proteins discovered in 2000. Only three types of pannexins have been found: 1, 2 and 3. Although pannexins and connexins do not share homologue amino acid sequences their tridimensional structure in membranes are similar. They both form hexameric hemichannels. Pannexin 1 is expressed in all tissues, pannexin 2 appears to be restricted to the nervous system, and pannexin 3 is found in bone, cartilage and skin. Pannexin hemichannels are not intended for cytoplasm-cytoplasm communication since they do not form channels with adjoining cells. They form isolated hemichannels in membranes communicating the cytoplasm and extracellular space. Low weight molecules like purines that work as paracrine signals can be released by these hemmichannels.